Gardens make you more mindful. When you’re outside pulling weeds you can only go so fast. You can’t text, or Facebook or send an email. You can listen to a podcast though, which is great. :-). Being outside tending to your garden on a regular basis also makes you more mindful of the seasons. Something I hear a lot is about how certain locations don’t have four seasons, or that a particular season is very short. Here in Texas, for instance, people are constantly saying that it goes from too hot to too cold in just a couple of days. It simply isn’t true. Most people go from inside their homes, to their cars to the mall or to their offices. The weather just isn’t in the top of their minds. So, the one time they go outside they notice the weather and they’ve missed an entire season. When you’re outside more regularly you really notice the difference in weather and the seasons. Gardens teach you to appreciate your food more. If you ever begrudge the cost of organic produce, just try growing it. All of the sudden getting a zucchini before being overcome by squash vine borers seems like a minor miracle. Not only that, but seeing a perfect tomato, or berry, or leaf of chard is something you truly take the time to recognize and appreciate it. Gardens make you move your body. When you garden, you spend time bending over working in the beds, carrying heavy bags of soil, moving throughout your garden, pulling on weeds and on and on and on. In most diet and exercise apps, gardening is even listed as an exercise that you can log and get calorie credit for. Gardens allow you to be generous. When one of your crops are in season, especially if the crop doesn’t lend itself to being canned, frozen or otherwise preserved…or if you simply don’t have the time to preserve it… you can give away the excess to friends and neighbors. Many food pantries will take produce as well. So much of the food in pantries is packaged food, so the people who rely on them don’t get much that is fresh. What a treat. Gardens are beautiful. I love staring at my garden. Gardens in general catch my eye. 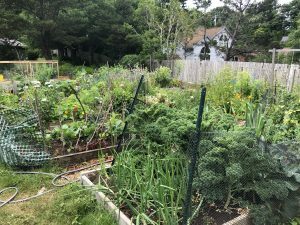 I’ve been known to swerve out of my lane when I first encounter a community garden I haven’t seen before. Gardens are just lovely to look at and spend time in. Gardens allow for lifelong learning. There is always something to learn or improve on. You don’t have to look very far to see something new to try. Just when you think you know how to grow a tomato, you’ll have a season where there is a new pest or a new weather condition that sends you back to the books to research how that leaf looks or why something isn’t happening. I guess lifelong learning is another way to say that gardening keeps a person humble. I know these reasons just barely scratch the surface of the reasons to love gardening. Why do you love gardening? I’d love to hear in the comments.